Today at 12pm, a blue heritage plaque will be unveiled in South Kensington to honour the American Social reformer and abolitionist Frederick Douglass. 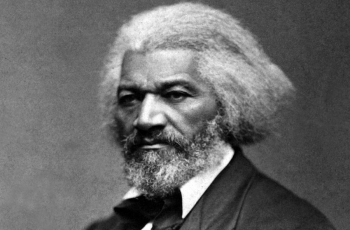 Douglass was an important actor in the abolition of slavery and was the first African American to receive a nomination for the presidency of the US. The plaque will be unveiled on Nell Gwynn House, Whiteheads Grove, South Kensington, SW3 3AX which is the site of the former home of British abolitionist George Thompson, who Douglass stayed with for a time in 1846, while lecturing in London on the horrors of the slave trade. Organised by the English Heritage approved plaque scheme, this will be the first blue plaque unveiled in the capital for 2013, which is being unveiled 118 years to the day Frederick Douglass passed away. The Nubian Jak Community Trust has partnered with the American Embassy to do the tribute, and the unveiling will be streamed live to the United States. The Royal Borough of Kensington and Chelsea are also supporting the event, which will include a reception after the unveiling where an exhibition displaying the work of 150 school students from 5 London schools will be shown. The schools have been working with Nubian Jak over the last three months in researching the life and times of Frederick Douglass. “Through his powerful oratory and fiery rhetoric, Frederick Douglass created a sensation in Britain, and it’s fantastic that his experiences are finally recognised with this Nubian Jak Plaque. Hopefully we can begin to understand what Britain meant to him, and it should kick-start an international discussion about Douglass’s time here. More importantly, we should all celebrate the achievements of this great man, a social activist who campaigned for, among others, abolition, suffrage and women’s rights." The plaque tribute ceremony is open to all members of the public. Plaque Ceremony: Nell Gwynn House, Whiteheads Grove, South Kensington, London, SW3 3AX.